I started by painting my nails black. 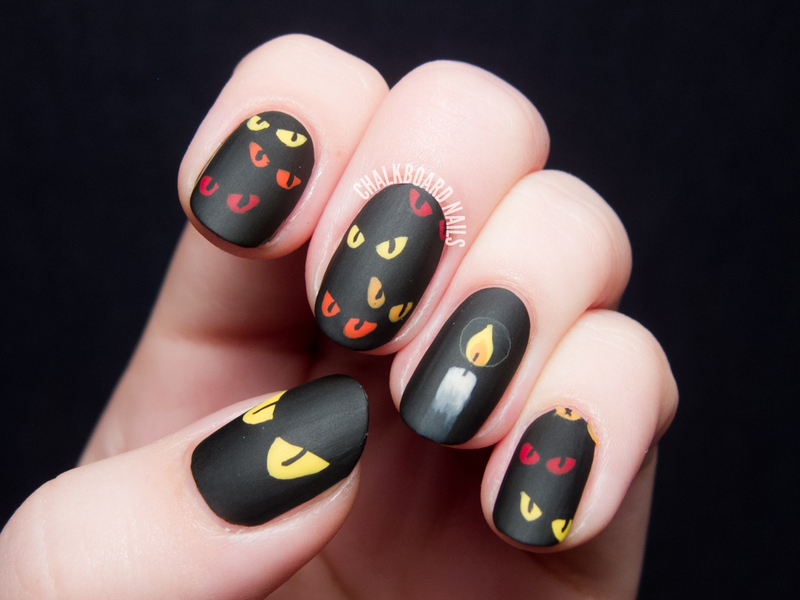 For the eye nails, I painted the eye shapes in various shades of red, orange, and yellow, and then added the black slits afterwards. 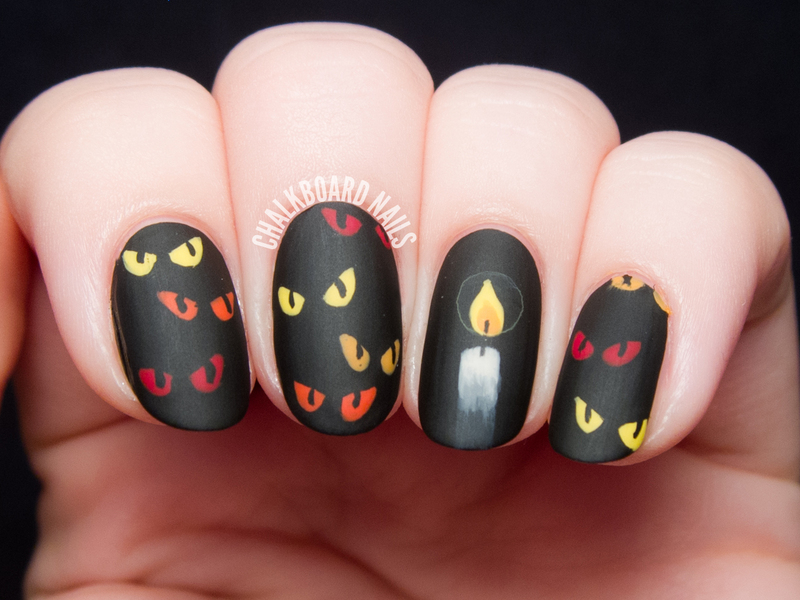 For the candle nails, I used the bubble technique for the glow on the candle, and then freehanded the rest. The gradient on the candle was created by mixing varying ratios of cream and black. I finished with a layer of quick dry topcoat and then a layer of matte topcoat. I have to admit - though unintentional, this design does remind me quite a bit of the old Nickelodeon show Are You Afraid of the Dark?. I think it's the single flame in the darkness, though in the show opening it's a match. That show always scared the bejesus out of me. I have distinct memories of being terrified of the one where the kids try to use the silver spoon to ward off a spirit, but come to find out it's actually steel so the spirit keeps approaching. 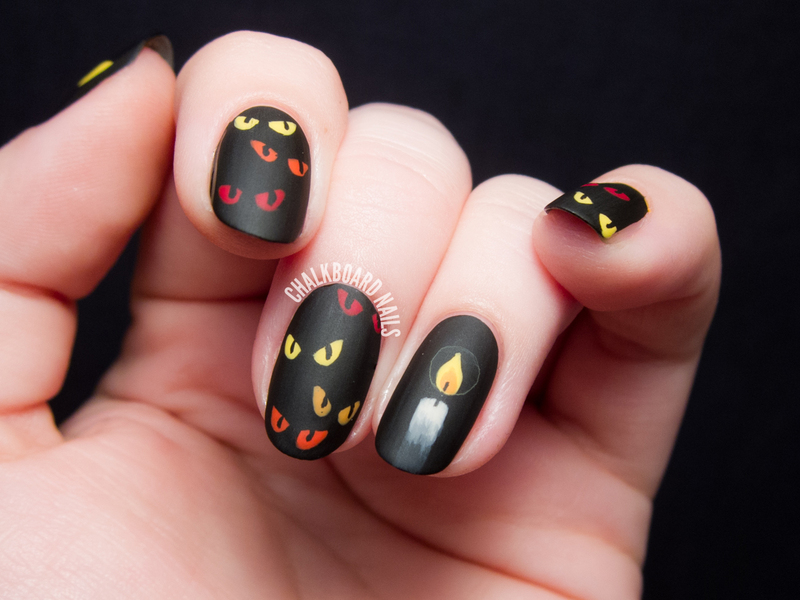 I think this might be my favorite Halloween mani this year. I might have to try those eyes later today! Love the candle on the ring! Fun design. That's such a great nail art! Love the candle! LOVE the little throwback there :D And the glow around the candle is really the icing on the cake here. I love the candle! And Are you afraid of the dark was very scary indeed!!! Oo, the candle is so cool! This is so spooky and cute, I love it! that is amazing! I wonder how long it stays before it starts to chip... I don't bother learning nail design because I'm afraid it wouldn't even last a week before it starts to fall apart.. I used to be obsessed with that show, until I saw the one with the creepy doll. I actually stopped watching because I was too scared to turn on the show on tv and have it be that episode! 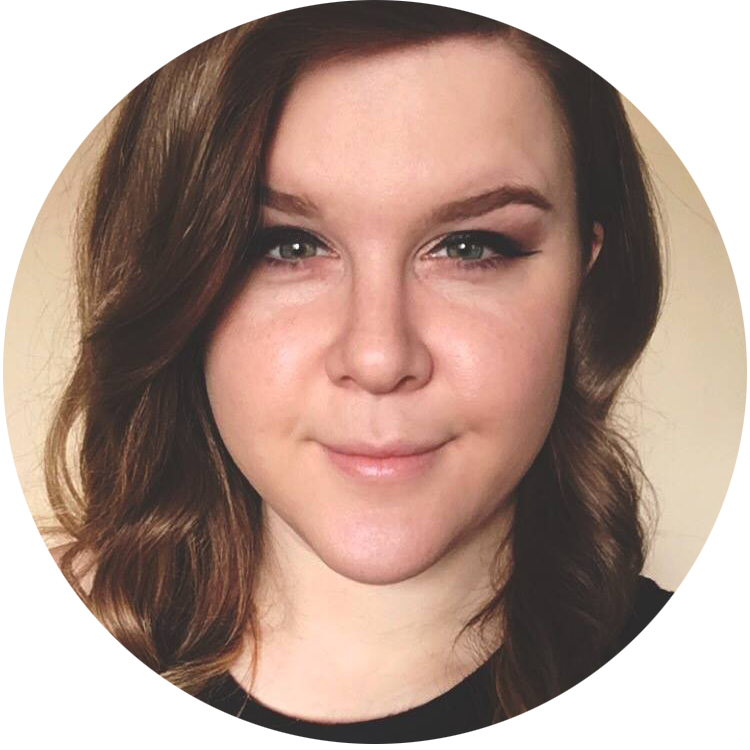 a hipster - Zoella & Tanya Burr Product Giveaway! These are very cool! I LOVE them! Very spooky! I love it! If anyone wants to get Android Training in Chennai reach FITA Academy located at Chennai, Velachery. http://www.androidtraininginchennai.co.in/ , to know more about android training course. If anyone want to get Android Training in Chennai , please visit FITA Academy located at Chennai, Velachery. hanks for sharing this informative blog. If anyone wants to get Big Data Training in Chennai visit fita academy located at Chennai Velachery. Thanks for sharing this informative blog. If anyone wants to get Android Training in Chennai reach FITA Academy located at Chennai, Velachery.